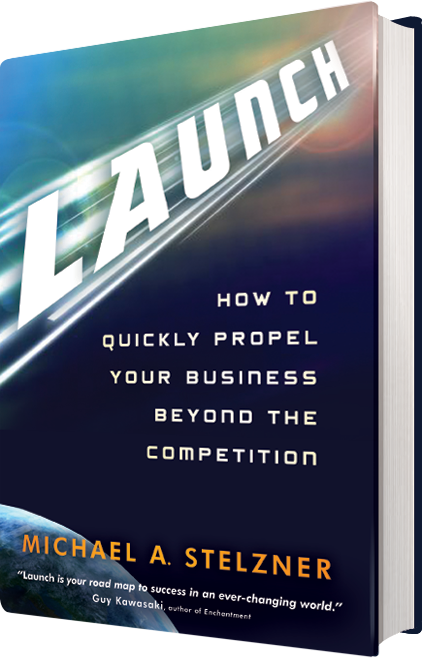 Michael Stelzner’s new book “Launch” (Click for Chapter 1) is a clear cut action plan that if you follow it step by step you won’t help but have online success. When I started Zentrader 3 years ago I didn’t really have any sort of business plan or even a game plan for that matter, and when I look back at all the mistakes I’ve made in running my blog, I’m amazed that it’s still up and growing like it is. If I would have read this book at my blogs inception, I have no doubt that I would have even more success than I’m currently having. Michael provides a lot of great ideas, that after you read them make complete sense in their simplicity, but the problem is most people don’t have a blueprint that they can reference that keeps them on the right course in their business. It’s easy to get “off track” which can sometimes derail your online efforts of generating revenue. Launch will show you how to grow your business by adding the right mixture of content, strategic partnerships, and marketing to ensure that your business stays on the right trajectory. Michael doesn’t waste any time as in Chapter one you’re introduced to the Elevation Principle (GC + OP – MM = G). I don’t even think Sheldon from the Big Bang Theory would be able to figure out this physics equation without the help of an expert. The GC stands for “Great Content”. Any blog must have content that is in demand, so be sure to pick a topic that you are passionate about. How you structure you content can be in the form of how-to-articles, reviews, expert interviews, case studies, and contrarian stories to name a few. The next part of the equation is OP – which stands for “Other People”. This really goes back to the golden concept of if you help others get what they want, then it’s inevitable that you’re going to get what you want. A major concept that Michael expands on is it’s important to give gifts that genuinely help people, without a hidden agenda. Your content, newsletters, any e-books you create must fill a void that your audience has to ensure they revisit your site. If you’re free content provides great value (after all it’s free) then your premium offer should go beyond all expectations. The last part of the Elevation Principle is perhaps one I’ve never heard anybody talk about, which is “Marketing Messages”, or to be exact, the lack of a marketing message. When Michael launched his blog, SocialMediaExaminer he refrained from advertising any products or services until he had at least 10k email subscribers. Now I personally think that may be a tad extreme, but it worked for him and his blog is one of the most successful in his field. The rest of the book goes into case studies to elaborate on each part of the Elevation Principle, all the while using rocket ship analogies to reinforce the concepts that if you want to experience exponential growth that sets your blog apart from others in your niche, you must be consistent in your message without being a salesperson, and use special “nuclear fuel” to get you there. This type of content is above and beyond what you normally provide, maybe a special report or video tutorial, with the specific purpose to grow your readership as your audience shares your special content through the social networks. There is zero marketing with this effort. My highlighter was sufficiently empty when I concluded Launch and that is always a good sign that I found it useful and plan to revisit it in the future to see which concepts I want to expand on. I would recommend this book to anybody who has a blog to open your eyes to the proper way you should be conducting your site from the top down approach to attain maximum success. If you can’t find any useful ideas from somebody whose been there, done that, then you must be at the top of your niche already or you shouldn’t be running a blog from a business standpoint. Michael provides easily digestible concepts in blogging and what not to do on the marketing side that I found personally interesting and plan to employ on my site. I’d like to congratulate Rose Johnman, who is the winner of the contest and will be receiving her very own hardcopy book of Launch very soon. Best of luck to her in her co-active coaching business and it’s my wish that Michael’s concepts will help her reach her goals faster than she would have. A big thank you for the others who participated in the contest.